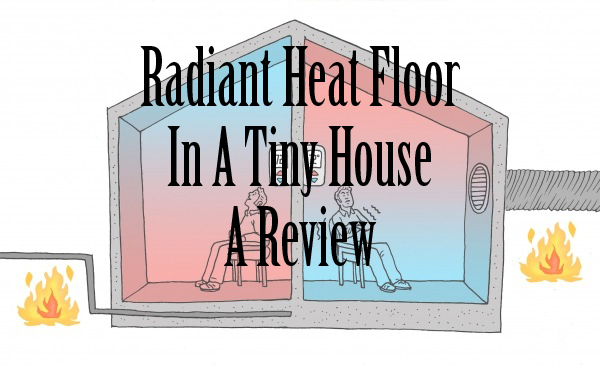 I often get questions about my radiant floor heat and I realized I never reviewed it… So here we go! Was it ‘worth it’ – It certainly served its purpose as a learning project, I learned how to install and operate it, I have no regrets about adding the thermal mass in the floor (and the extra axle that came with accommodating that). For me this was a learning project and I have indeed learned! Now, Would I do it again? – Naw. I would not. 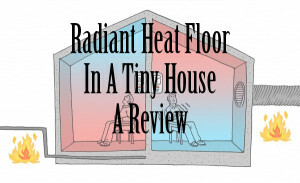 The radiant heat is not the most efficient way to heat the tiny house. Radiant heat is generally efficient because it heats your feet, generally if your feet are warm you are warm so you can actually keep the heat a little lower and heat rises so it uses heat more efficiently than heating high air like some other set-ups. In a small house, especially one with two doors there is a lot of thermal bridging where the thresholds meet the floor. There isn’t enough square feet to make up for that deficit, at least in my place. This makes for a cold space unless heated (paid for) in winter. I DID use electric rather than hydro or just straight solar to heat it. I have made it so that, unless I pay to heat the floor I have to deal with an ice cold floor, which is not great for babies to crawl around on (or my feets for late night bathroom runs!). I found that because of this I have turned it on before I actually would have turned my heat on otherwise so my heat cycle has been extended. Now- Just because I am not a fan of the radiant floor doesn’t mean they don’t have merit. This COULD be different if it was hydro or solar. The problems with those in a tiny though is 1) things move more than in a true foundation and it’s possible to crack a pipe and have big problems with hydro, I marked hydro off early for this reason unfortunately, it is really what I wanted… 2) Collecting solar heat gain is a double edged sword. You have to have a high solar heat gain coefficient (SHGC) on your windows which allows heat to come in. Most windows intentionally want to block heat gain so there would need to be special windows ordered (possibly costly). That sort of a system is generally only good to be placed one very specific orientation, if you park off from that you mitigate all benefits and open yourself up to issues. Both solar and hydro should be very carefully considered. I guess in short I would not suggest trying to capture solar heat to heat your space unless you are on a true foundation, same with a hydro set-up. That all being said it is possible, it is just something to be super calculated about. Most importantly maybe, heat systems don’t seem to be a problem at all, I live in a very cold climate, until it gets about 10 degrees outside my dog, my laptop and myself are pretty much sufficient for heating the house. It is a small space that really is pretty passively heated just by the nature of it. COOLING is another story and thermal mass has been SUPER helpful for that! If there are any other questions please feel free to leave a comment and I will answer it to the best of my ability for you and any others interested in the topic! Macy, I’m glad to hear that you seldom need heat. I recently experienced an Envi heater in a tiny house at the Caravan Hotel in Portland, and we were quite comfortable on a freezing, (just), very windy night, and we were quite comfortable. In my new tiny house, I’ll be trying a far infrared heater, which I find to be the most comfortable heat I’ve ever used. It heats items, not just air. It’s nice to sit on a warm couch, or not have freezing cold dishes. I’ve heated up to 1000 square feet with it in the past. They’re cheap to buy, and efficient, and won’t get hot to hurt Hazel when she’s moving around on her own. You might want to look into getting one. I got mine for $80. The biggest con of it is that it takes up floor space. I’m going to try mine in the storage loft. I’m looking forward to your report, and I’ll update you on mine, when I have data. I’m moving in next month! Hi Macy, You and I started our tiny mobile builds at almost the same time, so I have been enjoying and learning from your posts for some time now. The topic of Radiant Floor Heating tripped my switch and I had to write about my now truncated experiment with Hydro Heating. I got a whole bunch of PEX tubing for free when I was starting my build-out, which prompted the whole experiment in the first place. I wanted to see if I could heat the place with a branch off my potable hot water system, which consists of an electric 2.5 gal quick recovery heater pumping water into a “super-insulated” 6 gal. tank of an existing propane heater, which was an experiment itself. That part works fine. I haven’t needed to use the propane burner yet, and I get 8.5 gallons of water hot enough to require mixing with cold for a nice shower. I have to keep the storage tank “primed” with hot water throughout the day by drawing mostly hot water through the faucets, which I discovered is what I do naturally anyway. A success. As for hydro-heating….That branch is powered by a 12V pump on a timer set to circulate hot water through the under-floor piping for one minute every half hour directly back into the elec. heater. To conserve tight funds and weight, I opted to forget thermal mass entirely and see if I could heat the air between the “stringers” under my T&G pine floor, allowing some of that hot air to percolate into the space by drilling artful little “wormholes” in the flooring periodically. I DID find out that you can keep a well-insulated 185 sq. ft. trailer toasty warm in below freezing temps with a single $19.88 space heater from Ace Hdwe. Macy, I’m wondering what kind of skirt you put around the area below your tiny home? I found years ago that in a post and beam type home with the area under the home open to the elements (mostly wind and related temps), in the winter it can get really cold. I helped a friend one winter by stapling 6 mil plastic that went from the floor level to the ground around the entire perimeter of his home. Kept the breezes out (and the leaves, etc) and interior temps up. Reduced the heating bill by over half. Nice to have the breeze in the winter, so he was loathe to put anything permanent. In the far north, we used to pile snow around the house perimeter (protected by wood sheets, plastic, or building paper to keep the wind out. I hope this gives you some ideas, or perhaps you can share that you had done exactly this and the radiant floor still wasn’t enough. Hi Susan, great point! I used rigid insulation with expanding foam in the joints so it should be pretty air tight. I also used R-42 insulation in the floor which is about double plus ‘most’ tiny houses. I also have a radiant barrier to reflect the heat back into the home (in theory, not sure about reality). The only place I actually skirted is where all the plumbing goes (8’x8′ area near the kitchen side), which is insulated. Thanks for clarifying that! I chose to go with radiant in floor heating and ceramic floors in my tiny home and do not regret it in the least. I am fortunate that grid electricity where I am is reasonably inexpensive particularly since we have below freezing temperatures from mid October through to April. The infloor heating maintains the heat in the house throughout the day (so far, as this is my first winter in the house, I still have a lot of cold weather to contend with). The tile floors a bit of a gamble as there is the chance of a really cold floor if the power goes out, which it has here, once for three weeks, but mostly for a few hours, if it does go out. That being said the infloor radiant heating is, even with a more insulating flooring, a wonderful thing. I also have a propane furnace in my tiny house which will be the main source of heat throughout the winter. I am a firm believer in multiple heat sources from different energy sources in a harsh winter climate. If one heat source goes out, there is a backup. If your aren’t able to set up your house with more permanent investments, like digging down to insulate the underside of the trailer, the infloor heating keeps my floor from being uncomfortably cold sufficiently heats my house without any supplemental heat when temperatures are just below freezing. Where are you located, Natalie? What kind of radiant floor product did you use? I’m considering using radiant floors in my tiny but have having a really hard time deciding on which product. I don’t have a tank, I use electric. Heating is very important. It will take the winter months a lot easier to manage. I do not know that you could install heating into the floor, I might have to get that someday. I know this blog post is a few years old, but wanted to share with your readers an alternative to hydro or solar system. There is a product called STEP Warmfloor. You can get more information at https://theperfectheat.com. This product is great for tiny homes. While it is an electric system, it is extremely energy efficient. It generally cost 40 -60% less to operate than other heating systems. It can also run directly off of DC power, so it can be used directly with solar panels. It can be used directly under any flooring type.